Quick home hem: in a very short time we place the hem of your fur. 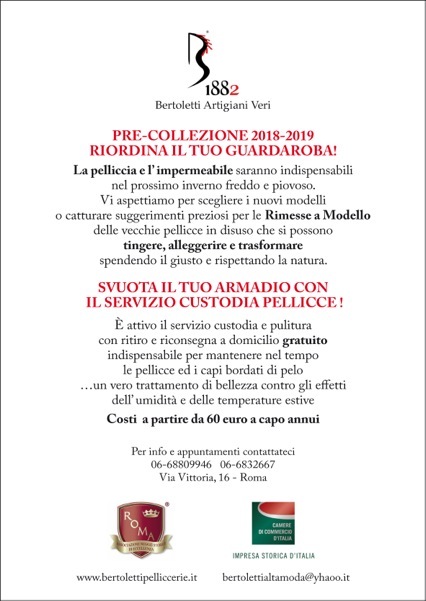 Remodelling: a new way to obtain an exclusive Bertoletti model using your own old fur. 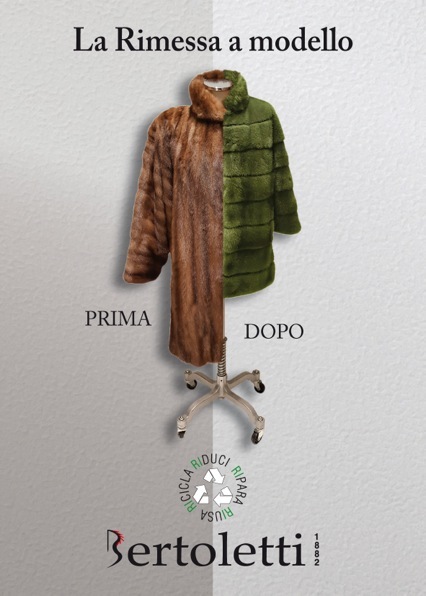 Personalised dying of furs and leather: we create personalised colours for dying furs, soft leather, suede and fabrics in cooperation with solely Italian tanners and weavers. Shave-system: our exclusive system for updating old furs by shaving the fur to obtain a velvet effect. Cleaning service: the service entails specific techniques used to clean both the fur and fabric, and includes home pick-up and delivery. Safe custody service: the service is covered by insurance and custody is in a damp-free, temperature-controlled strongroom to preserve the fur and leather, and includes home pick-up and delivery. Costs from 60 euros per year per piece. Assessment and evaluation service: Francesco Bertoletti was registered in the Rome and Province Roll of Assessors and Experts under number 1422 on 21.1.1997 for categories 13 and 14 of the Criminal and Civil Court of Rome. Contract manufacturing: we can design, manufacture and produce collections and bespoke work of leather, python, crocodile, fur and textiles, including home furnishings, luggage and bags in the same materials.